Reza Farahan was born on the 5th August 1973 in Tehran, Iran, and is a real estate agent and television personality, probably best known for his appearance in the reality TV show entitled “Shahs Of Sunset”, which has been airing on Bravo channel since March 2012. He is also recognized for being an outspoken gay person. Have you ever wondered how rich is Reza Farahan? According to sources, it is estimated that the overall size of Reza’s net worth is over $7 million, as of early 2016. The main sum of this money is coming from his work as a real estate agent. Another source is coming from his involvement in the entertainment industry. Although Reza was born in Tehran, his family migrated to USA when he was still a child, settling in the Beverly Hills area, where Reza spent his childhood. Regarding his education, Reza attended Beverly Hills high school, then in 1991 enrolling in San Francisco State University, receiving his diploma in 1995. Before he became a television personality, Reza was a real estate agent, working for the Keller Williams Realty in the Los Angeles, alongside Mercedes MJ Javid, which became the main source of his net worth over the years. However, thanks to his friendship with another Iranian star Mercedes MJ Javid, he was selected for the first season of the Bravo TV show “Shahs Of Sunset”, alongside other cast members such as Mike Shouhed, Asa Soltan Rahmati, Asifa Mirza and Golnesa GG Gharachedaghi. The first episode of the show was aired on the 11th March 2012, with over a million viewers. The first season consisted of six episodes, and thanks to the popularity of the show, it went on to its second season, which was expanded to 13 episodes. The show`s popularity increased, as the number of viewers increased to two million for each episode, which only boosted Reza`s net worth, since he was signed to a higher contract. Shahs Of Sunset continued with its third season, which had 16 episodes, however, the popularity declined, as the number of viewers only reached one million, but it still reached 4th season. Most recently, the show entered into its fifth season, which will start from April 2016, and it will certainly increase Reza`s overall net worth a bit more. When it comes to his private life, Reza Farahan has openly talked about his sexuality, and he is married to fashion model Adam Neely. His sexuality was the reason he joined the “Shahs Of Sunset” in the first place, as he wanted to raise awareness of gay teenagers who commit suicide, due to the constant bullying they receive for being gay. Reza also serves as the spokesperson of the Persian gay community, and is on a mission to inspire gay people, mostly teenagers of Middle Eastern ancestry. As with many other celebrities, he spends spare time on social networks, such as Twitter and Instagram, on which he has over 360,000 followers. His current residence is in Los Angeles, California. Movies Sharknado 3: Oh Hell No! 1 Graduated from Beverly Hills High School in 1991. 2 Graduated in 1995 from San Francisco State University. 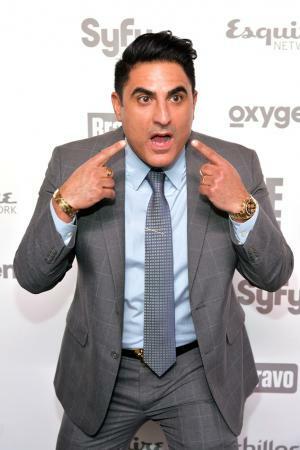 Reza Farahan Teases Shahs of Sunset's "Insane" Season: "It Just Keeps Getting Better"